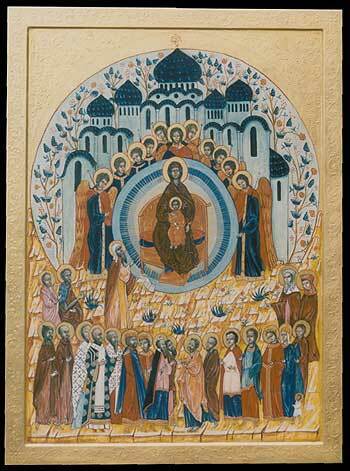 The icon is a visual depiction of the hymn ‘All Creation Praises Thee,’ which comes during the Commemorations, part of the consecratory prayers over the bread and wine in the Divine Liturgy of St. Basil, the eucharistic liturgy of the Orthodox Churches. The hymn begins, ‘All creation praises thee, O woman full of grace, the hierarchy of angels together with the human race.’ All eucharistic liturgies of the sacramental traditions understand our earthly Eucharists to be participations in the great heavenly liturgy. Here the Church on earth and the whole company of heaven join in praise of the Blessed Virgin Mary, whose womb, the hymn says, God made his throne, ‘making it more spacious than the heavens.’. « Parish Interview: What Practical Steps Can We Take to Carve Out Time for Daily Contemplation? You are currently reading All Creation Praise Thee at Blog of St. Luke in the Fields.